Here’s another FO in my quest to outfit the children of Afghanistan with my wool oddball stash. These should fit a child aged 2-4 years and used about 60 yards of worsted-weight yarn. These are my first mittens using standard mitten construction. The Target Wave Mittens were my first mittens ever, but they’re built in a non-standard way. I mashed the cable pattern from the cable and rib hoodie and the cabled pom-pom hat in with the mitten pattern from Ann Budd’s Knitter’s Handy Book of Patterns and wound up with these. I made a few modifications to the standard pattern. First, I added increases along the back of the mitt to adjust for cables’ tendency to pull in. Second, I moved the decreases for the top of the mitt and the thumb to the sides, opting for a flat top instead of the spiral decrease pattern in the book. I’ve just cast on for one more child hat, and then hopefully my oddball stash of Elann Peruvian Highland Wool will be gone. Then we’ll see about depleting my Cascade 220 stash. CogKnition posted this on April 15th, 2007 @ 1:55pm in Baby Items, Finished Objects, Hats & Mittens, Knitting for Charity | Permalink to "Cabled Child Mittens"
You ask what I’m thinking – I’m thinking WOW, I love the oddball mittens, I’ve been knitting mittens myself for my own kids, but nothing as crazy as those target ones. 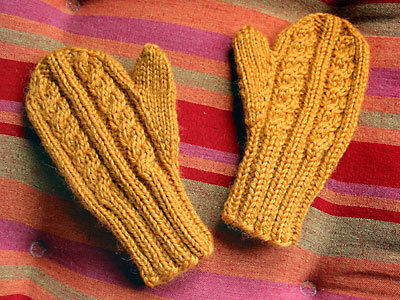 Mittens go so quick it must be time to knit some and work out how best to knit and send from new zealand. Waht a very good use for project ‘left overs’ – what will you do with the sock yarn? Marvelous mittens! I’m hoping to do something similar in an adult size. Thanks for the tips on how you modified the pattern to work with the cables.